Black color, all by itself, is very neutral, and it is possible to include black glass coffee table with drawers into any interior color palette. This will be very beneficial for those homeowners who have already finished working on their room decoration and are now looking to spruce it up a bit. Black can be combined with any other interior shade or even shades. Not only black can easily be combined with other colors, it is simply perfect for creating contrast. If black furniture units in your living room are few, they will act as gorgeous contrasting elements. Sure, one of the most impressive arrangements would be to contrast light walls with dark furniture. Practically all glass coffee tables are made of tempered glass these days. This is one of the most durable production materials in the furniture market – so, it is totally safe for any family, even the one with little kids. Another great benefit of tempered glass is that it is incredibly easy to maintain. For starters, it is resistant to dust and to moisture, and does not require regular polishing. Cleaning is simple as ABC – just stash away some glass cleaning liquid and wipe the surface from time to time – and your glass coffee table will look good as new for decades. Quite obviously, drawers may come in handy for a variety of different objects. If, for example, you have a small living room or are simply not fond of creating cluster, black glass coffee table with drawers will play both decorative and functional role in your room. Finally, there are several designs you might appreciate. There are tables that feature only a couple of small drawers under the table surface, as well as models featuring drawers from top to bottom. 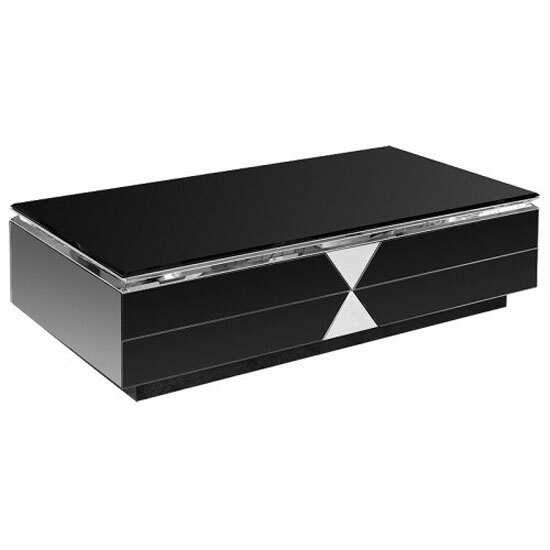 The bottom line – a black glass coffee table with drawers is an incredibly stylish decorative solution for modern rooms, even though not the only one, of course. If you are looking for some alternative options, visit Furniture in Fashion website. This is one of the biggest stores in the UK, so the selection on their website is truly worth checking out. In addition, you can always make a trip to company showroom in Farnworth if you would like to take a look at the listed models in real-life mode. And the best thing is that this store offers a very affordable pricing policy and impressive discounts on selected items.